Teachers, which would you prefer? Discussion in 'General Education' started by RussianBlueMommy, Sep 12, 2018. This will be my 4th year (3rd year in this district) as a relief/building full-time sub. I am trying to tweak the cards I leave behind for the regular teacher. This has been my "trademark" for several years now. 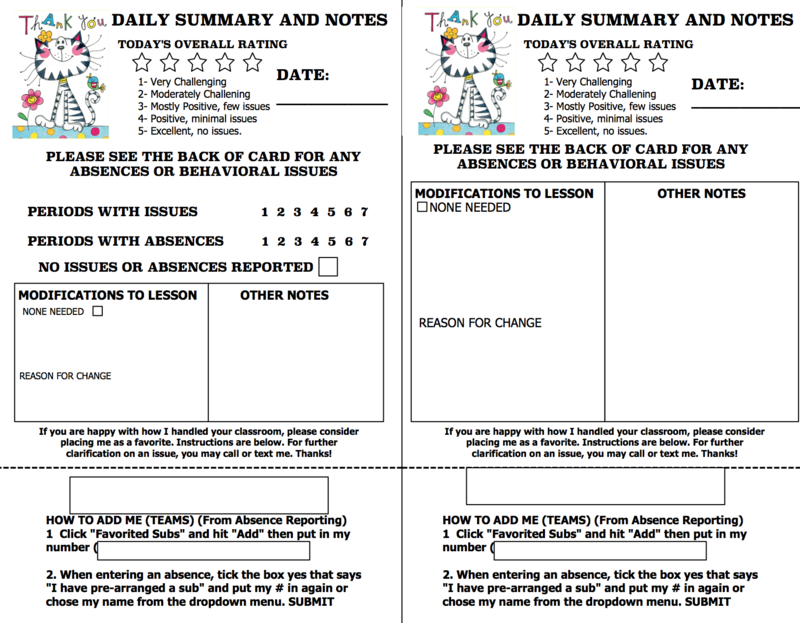 I print them on neon card stock so teachers have a record of what went on with behavior, attendance, lessons, etc. As a regular teacher (high-school) which format would you find most helpful? The back is just notebook paper lines. The cat is me, even y signature rubber stamp has a cat on it. I have blanked out my personal info such as name and ID #. My prior cards (which I am nearly out of) did not include the star rating and simply said "It has been a pleasure to fill in for you today". They also did not include the section for other notes or modifications to lesson plans. Here are my 2 designs I am working on, of course, I am also open to other designs. My goal with the cards is to give the teacher immediate feedback of the overall day. Specifically, What information would you desire a sub leave behind? Thanks! They are both really cool. I think the first one is more specific, so that would be my preference. If you do cover a teacher that has multiple preps, what do you do? I have 5 preps, and one any given day, I have 3 different classes. Just curious. I like #2 better because there's more room to add detail where necessary and it's a little less cluttered looking. I think this is a great idea! We use Frontline/Aesop which asks subs to leave feedback, but I am always amazed when subs don't leave me so much as a note on how things went. I mean, I guess no news is good news, but at least leave me a quick note either way! As far as multiple preps, what I have done in the past is just add it on the back as a note for that specific. When I write absences or issues. I wondered about having a separate slot for each. And in that slot would have this information but I like to keep the cards to half paper size because I hot glued the top to make it into a tablet and it fits inside my pad folio. I’m not against redesigning it to full-size pages however . They are designed currently for the teacher to cut off the card at the bottom so it works like a business card and this has always gotten me a special request for teachers. I used to sub and now I have my own classes so I might be able to address the bolded part. Some teachers don't want to hear how things went. Subs have many, many more behavior issues than regular teachers. And some regular teachers don't want to hear it. I've had colleagues tell me that they're gone for the day and they don't want to think about what happens while their gone. They don't want to worry about what happened when they return. They expect the sub to handle discipline issues and they won't get much support for handling it themselves because they weren't there to witness what the kids did. If they're gone, they want to wipe their hands of the job completely. Other teachers see any negative reports as admission that they can't handle the class. Neither type of teacher will want the sub back in their rooms. Subs know this happens and often won't leave notes. I ask that subs make any notes on the letter I leave for them. I think the card you leave is great, but I would rather have any notes next to my instructions. I always leave a form for the substitute to fill in for me. Even though I technically teach the same thing every class period, the classes are different enough that I really need separate notes for every class period. Of the two you presented, I like the one on the right better because it is less visually cluttered. Ditto. That way I can quickly glance at the plans I left to get an idea of how the day went, where the sub left off, and what I need to pick up with tomorrow. I used to sub and now I have my own classes so I might be able to address the bolded part. Some teachers don't want to hear how things went. Subs have many, many more behavior issues than regular teachers. And some regular teachers don't want to hear it. Personally, if my classes cause problems for a sub, I want to know about it, since I would want to rethink my plans and try something else that would work better for next time. I actually think my students do really well for the subs and that's why I don't get much in the way of notes, but I always appreciate hearing what happened, either way! My school has a form the subs must fill out. Most subs write "great plans, great class". I would love to have you sub for me with such detail. The right one seems like it will be more practical. Another question. Suppose this was in a digital PDF format and e-mailed to you? I recently got a grand for an iPad pro and LOVE It. I have gone digital with so many forms for various uses (such as my church forms, and the documentation for my second job etc).